French clothing brand See U Soon was founded in 2006. Since its inception, the label has been developing inhibition-free fashion, where subtle vintage style is blended with 60s cuts and revitalized 70s prints. Drawing inspiration from across the decades and different countries, See U Soon offers a simple and feminine line. Keep stylishly warm with this range of See U Soon knitwear. 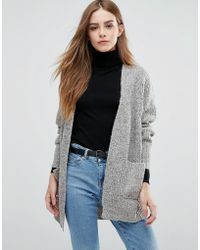 From slouchy cardigans to cable-knit sweaters, these pieces will fit seamlessly into modern wardrobes.